The UK Metro NY loft and sailmaking business has been taken over by new management led by Constantine Baris, a lifelong sailor and racer who is now pursuing his passion for sailing by building the UKNY business into a more robust and broader reaching offering for cruisers and racers alike. His motto of “sail fast and stay on budget” appeals to all sailors. His longtime friend, business associate and sailing buddy companion Kevin Crouchley will be managing loft operations and sales in an effort to produce UKNY 2.0. Left to right: Butch Ulmer, Adam Loory, Kevin Crouchley, Emmett Dickheiser, Conny Baris, Tommy Nye. Patriarch of UK Sailmakers and sailing legend Charles (Butch) Ulmer is staying on to continue to help provide our customers with the most insightful color on racing rules & tactics, as well as assisting in designing the optimal sail plan for each sailor’s specific needs. The experienced sail loft staff will be providing professional repairs and service to all UK customers. We continue to offer our concierge winter service and storage to help keep sails clean, fresh and ready for the next season. The Sydney 43 CHRISTOPHER DRAGON won her division at Key West Race Week 2016 with eight firsts and a second sailing with a full inventory of Uni-Titanium upwind sails. For repairs, our service department prides itself in getting sails and Canvas fixed the same week that you bring them during the summer months. We don’t want you losing precious weekends on the water. For cruising sailors looking for durability and performance, nothing beats UK Sailmakers' X-Drive sails made with hundreds of high strength tapes reinforcing nearly 100% of the sail's surface. 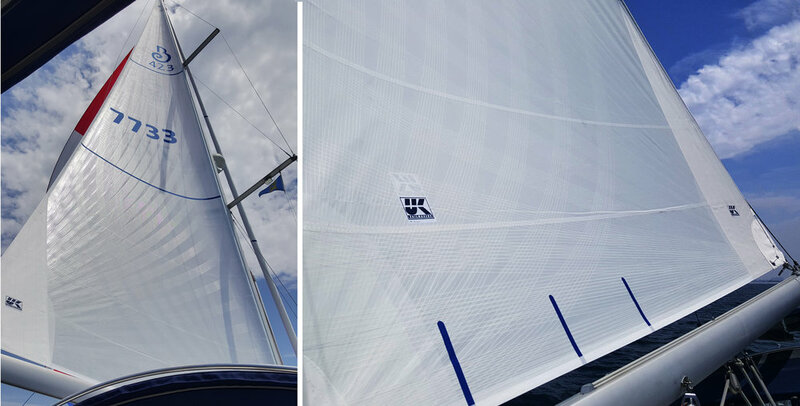 We offer tapes made with S-Glass yarns or Endumax filaments that make high performance sails with an all-white appearance.